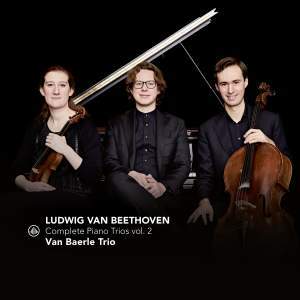 Challenge Classics has announced the release of the Amsterdam-based piano trio Van Baerle Trio‘s new album: Beethoven Complete Piano Trios Vol. 2. Comprising pianist Hannes Minnaar, violinist Maria Milstein and cellist Gideon den Herder, the disc features Beethoven’s Piano Trio No. 2 in G major, Op. 1 No. 2 – plus Beethoven’s own Piano Trio arrangement of his Second Symphony Op. 36. “After the release of two earlier albums, we decided to undertake the great challenge of recording the complete works for piano trio by Beethoven …” the ensemble has told The Violin Channel. “What fascinated us from the moment we started this project is the incredible variety and originality of Beethoven’s writing for trio …. we want to share with our listeners our fascination for these revolutionary works … and the excitement brought by this music,” they have said.